The Kickstarter for the 99th issue of Crash magazine has gone live. Roger Kean is back on editing duties, and Oli Frey will be creating the cover and art - we'll even see the return of the Jetman comic strip. The line up of other contributors is also looking rather impressive. Crash holds a special place in my heart - it was my main go to mag back in the day (before, I admit, I jumped ship to the C64...), and I still have all the well worn issues I used to pore over each month. So this was an instant back for me. The timing is perfect too, with the Spectrum Next arriving in the new year. What a great time to be a Speccy fan! One year and two months after Newsfield launched LM, the decision was made to end the experiment. Only 4 issues of the ambitious magazine were published and it had struggled to gain the support of ad agencies and their clients. The magazine had set out to cover "every aspect of life" for the youth audience, but was seen as being "too widely targeted" by advertisers, despite healthy sales. The closure of LM brought some changes at Crash. Ciaran Brennan, who had started as editor of Crash last month, was moved over to Zzap and a new section of Video Reviews was introduced. Elsewhere, Argus closed its Computer Gamer and ZX Monthly magazines due to poor sales. Melbourne House ditched their Inspector Gadget game citing problems with the Spectrum program. Apparently the game "by David Moore and William Tang blew up in the software house's face". It had been a year since Gremlin released "Bounder", and the followup "Re-Bounder" was announced (it was never released on the Spectrum). The movie "Platoon" had topped the box office last month and Ocean snapped up the game rights. West Germany banned submarine sim "Silent Service" for being "too realistic". An interview with Mike Singleton and crew from Consult. Mike's game history was discussed along with some details about what the future held. The ambitious Play By Mail "Dark Sceptre" was "nearly finished", and "Eye of the Moon" would be done when it was "good and ready" (sadly that would be never). Derek Brewster wrote a short guide with five steps to writing a good adventure. Robin Candy examined the state of the software market, which had changed hugely since the first issue of Crash. Small software houses were finding it hard to compete with the likes of Ocean, and the big companies were more risk averse and focussed on attracting customers with flashy graphics and advertising. On the plus side, software was much easier to find on the high street and developers could go through publishers which allowed them to concentrate on writing the games rather than marketing and distribution. "Hydrofool" Gargoyle Games - 90% Crash Smash "A first class sequel, entertaining, addictive and highly amusing." "The Pawn" Magnetic Scrolls - 90% Crash Smash "Really engaging, complex adventuring." "Shadows of Mordor" Beam/Melbourne House - 93% Crash Smash "Shadows of Mordor looks a very interesting game. The test of any game is how easily it entertains and I've got to say I really enjoyed reviewing this Melbourne House classic." "Shipwreck/Castle Eerie" Tartan - 82% "Shipwreck and Castle Eerie are rather entertaining adventures. They look smart and have engaging themes. I particularly liked Castle Eerie, whose problems are especially fun to solve." "Book of the Dead" The Essential Myth - 88% "Book of the Dead is a fine adventure in just about every department." "Inheritance" Infogrames - 86% "Inheritance is a typically good looking Infogrames game, consisting of three parts which are played in order, with a code transferred between each." "Saboteur II" Durell - 83% "Involving and challenging beat 'em up which successfully incorporates its adventure elements." More changes at Crash towers this month with three new staff members: Ian Phillipson, Gareth Adams and, perhaps most notably, Ciaran Brennan. Mastertronic was branching out into the video and music markets by launching the Master Vision and Master Sound labels. The Tau Ceti system was to once again be the setting for a new game from CRL called "Traxxion". Piracy was rife in the USSR with the "Raid Over Moscow" and "Rambo" proving particularly popular. Several flight sims were about to arrive with "Gunship" and "F-15 Strike Eagle" from Microprose, and "F-16 Fighter Falcon" from Digital Integration. It's a bit hard to tell if the F-16 game was "F-16 Combat Pilot released in 1991 by DI, or actually "F-16 Fighting Falcon" by Codemasters in 1989. Activision were to start re-releasing their back catalogue with nearly 40 of them due in the coming year. Prism Leisure bought Addictive Games, the company behind "Football Manager" and made famous by Kevin Tom's smiling face. Palace announced that their next game to hit the shelves would be "Stfflip and Co" - a co-production between Binary Vision and Electronic Pencil company. This month saw the return of the much loved Terminal Man comic series. "Enduro Racer" Activision - 92% Crash Smash "A risky Spectrum conversion that has paid off handsomely, providing all the thrills and spills of the original." "The Sentinel" Geoff Crammond/Firebird - 97% Crash Smash "Highly playable and addictive, The Sentinel is one of those rare games that makes owning a computer a delight." "Auf Wiedersehen Monty" Peter Harrap/Gremlin - 85% "A fine continuation of the long-standing Monty Mole theme." "The Sidney Affair" Infogrammes - 86% "The Sidney Affair is a superb idea but I'm not totally convinced it has been presented that well on the Spectrum." "Kobyashi Naru" Mastertronic - 83% "Kobyashi Naru is a superb piece of microcomputer programming for the paltry sum required." "Matt Lucas" Players - 84% "But small niggles apart, Matt Lucas is a really fine game for the asking price." "The Professional Adventure Writer" Gilsoft - 97% Crash Smash "The Professional Adventure Writer is just that, a professional's aid, even if only for developing games for later coding. BASIC or machine code additions are catered for and a SAVE'd database can be verified. I found the program exciting and am excited by its possible achievements." "Amaurote" Binary Design/MAD - 48K 92% 128K 94% Crash Smash "An amazing achievement in budget software, highly playable and addictive." 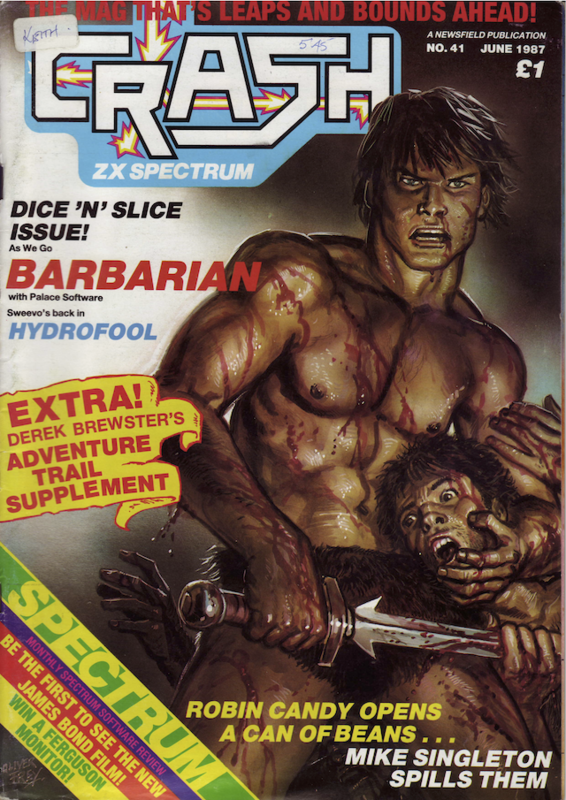 Roger Kean, who was the original editor of Crash, returned to resume his role after moving to Zzap64 a couple of years earlier (which had earned him the title of "traitor" from loyal Spectrum fans). Graeme Kidd was now to be editor of the ill fated LM magazine. The Power House (a sublabel of CRL) announced that every game they released would contain either a free game or audio track. The inhouse music ensemble would be headed by Wayne Allen of House Electronic Xperience. The first title to have a track included was to be "Tomb of Syrinx". Domark moved in to their new offices in Wimbledon. Martech admitted there was a balls up during duplication of "Uchi Mata" (which scored a rather dismal 36% in this issue) and a number of copies that were sent to distributors were actually pre-release previews rather than the full game. Changes were afoot at Thalamus (the Newsfield owned software house): Andy Wright and Gary Liddon had left the company for "pastures new." Paul Cooper was now running the show. Rumours were circulating about a +3 Spectrum which would feature a disk drive instead of a cassette player. In the article about the Z88, a "STOP PRESS" footnote was added which said Amstrad had indeed announced the +3. A complete lack of gaming leads resulted in a desperate Minson attending the launches of WordStar 4 (yes, the word processor), a word processor from Borland and a spreadsheet from Neric. The WordStar launch was notable for the fact that, when it came time to demo the program on stage, it completely refused to work. Sir Clive Sinclair was busy working on a new portable computer, the Z88. The machine featured a small LCD, was about the size of an A4 pad, weighed less than two pounds and would run for up to 20 hours on four Walkman batteries (though Sinclair had a tendency to overstate battery life). It would come packaged with word processor, spreadsheet, database and diary software, as well as BBC BASIC. Was it any good? Well, the terms of the sale of Sinclair to Amstrad meant that Sir Clive had to offer any new computing related inventions to them first... they promptly declined the Z88, so Sir Clive was free to go it alone. Crash spent a day in the arcades. "Wec Le Mans 24", "Out Run", "Night Stocker", "Soldier of Light", "Side Arms", "Gryzor", "The Castle in Darkmist", "720 degrees", "Rock 'N Rage", "Bubble Bobble", "Lock-On", "Darius", "Victory Road", "Firetrap", "Danger Zone" and "Video Football" were covered. Minson interviewed Steve Taylor, a programmer at Beam Software. Mastertronic had bought the UK arm (Melbourne House), but Beam was to remain independent and continue developing games. While Steve was in the middle of a long world trip having just wrapped up "Fist II", he did reveal that his next game was to be based on the University Unix machine favourite: Rogue. "Head over Heels" Jon Ritman & Bernie Drummond/Ocean - 97% Crash Smash "Wow! this is the ultimate game! Head over Heels has some fantastic graphics; it proves to all disbielevers that there is still something left in the forced perspective 3D world; the characters are superbly designed, and the animation has to be seen to be believed!" "The Growing Pains of Adrian Mole" Level 9 - 88% "I consider the Adrian Mole games to be very entertaining, as they draw on some great material from the Sue Townsend books." "The Kingdom of Krell" Steve Screech/Anco - 86% "Although I had reservations during the early stages of play (including the annoyance at only one arrow key to return to the main menu rather than the two together outlined in the instructions), I must say that after a while the effort that has gone into producing this game does begin to make itself apparent." "Red Lion" Mystic Software - 86% "Red Lion is a well-researched piece of software, and shows many features of which I most heartily approve." "Vulcan" CCS - 94% Crash Smash "The state of the art in Spectrum wargaming." "I, Ball" Firebird - 90% Crash Smash "A great little game with plenty of lasting appeal."